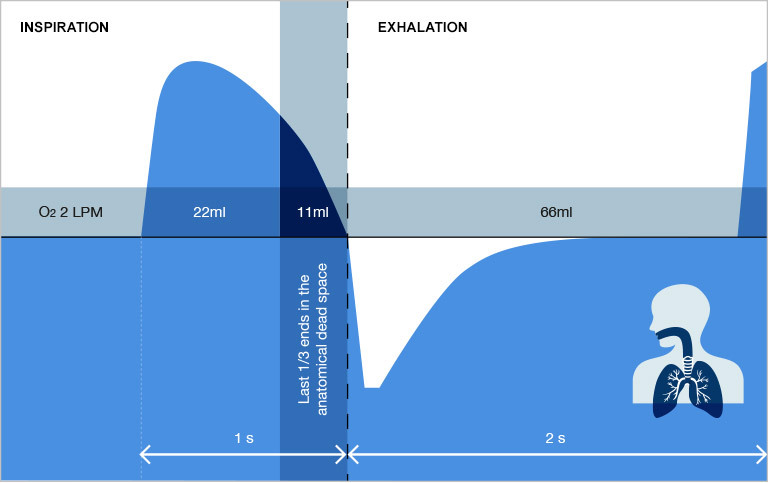 The following graphs are included to explain in detail the benefits of the Oxygen Therapy by Invacare. Experts and patients can find here the comparisons between the continuous and the pulse dose delivery systems. 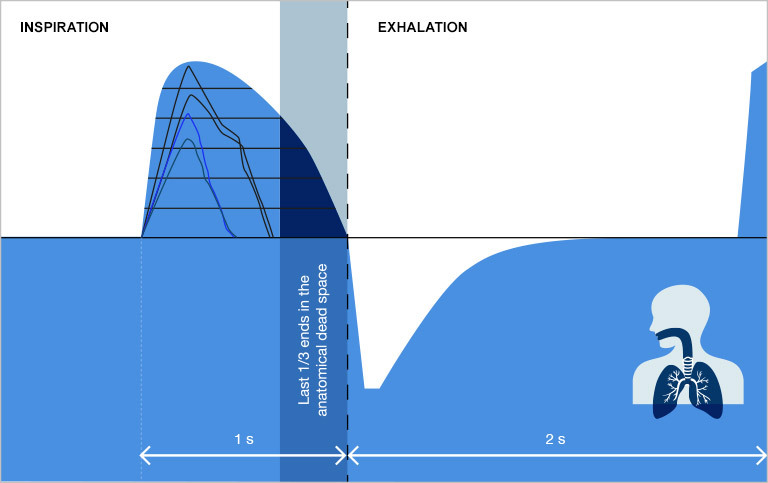 More than 75% of O2 flow is wasted during exhalation and in dead space. At 2 LPM, a patient only uses - 0.5 LPM (22ml x 20). Clinically Efficient: An oxygen bolus is delivered at the beginning of the inspiration, optimizing gas exchange. Fixed Minute Volume: SensiPulse technology adjusts the bolus volume per breath in response to the patient’s respiratory rate to ensure a constant minute volume of O2 per setting. The Sensi-Pulse conserver delivers only clinically beneficial oxygen at the beginning of inspiration allowing the maximum opportunity for gas exchange. 1 Litre Cylinder 9.3 5.9 4.5 3.6 3.0 1h 20min. 1h 20min. 1.7 Litre Cylinder 14.3 9.1 6.9 5.6 4.7 2LPM 5min. 1h 40min.